I started the week listening to Judas Priest and catching up with reviews of Nostradamus. (Their inclusion of orchestrations has provoked heated debate amongst their fans.) So by way of a heavy metal antidote here are a couple of tracks I’ve been meaning to post for weeks – from Duncan Waugh and Chris Taylor. I’ve mentioned the arranging and recording team of Duncan and Chris on here before; they’ve completed much work for Cunard in recent years (theatre production recordings) and do an impressive job. The scores are all immaculately arranged, recreating an enormous variety of styles – anything that comes up for Cunard’s theatrical shows – but I particularly like the traditional light-entertainment arrangements, a genre that doesn’t get much of an airing these days. There are some sampled instruments in the recordings but they don’t skimp on live players! My task is simply to put some life into the string lines. Here’s an excerpt from an arrangement of The Best Is Yet To Come. And an excerpt from a Celtic medley. It’s been a good week for listening in the realstrings.com office! Mixes of the Moscow sessions are coming through from Tim Duncan (all sounding good) and the new album Nostradamus by Judas Priest was released on Monday. Whatever you think of heavy metal, this work is an epic and an awesome achievement. It’s not everyday the phone rings and someone says (in a Brummy accent) ‘hi pete, it’s Glenn Tipton from Judas Priest, could you put some strings on our new album’. The contact came through Attie Bauw who produced this album and we talked about various ways of getting some realstrings on the production. In the end, the recording was done at realstrings.com though the process was odd; the band did not want to release rough mixes from their studio, so I spent a day listening with them, making notes and bringing away midi files from the keyboard arrangements. My task was to recreate synth string lines and in some cases add some arrangement ideas. As all we had to play along to were midi guide parts, it’s something of a miracle that any of the phrasings and articulations worked! The band used most of what we prepared and judging by some live gig footage on YouTube, some of our recordings are featuring in their current tour also. The marriage of heavy metal and strings sits well for me – both offer energy and emotion but with contrasting timbres. 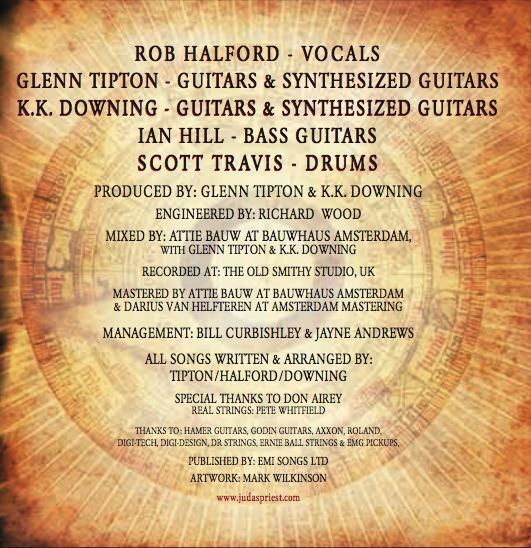 We get a pretty good credit in the album booklet! Better fill in my ppl form on this one – should get some radio and tv play! I’m fascinated by social web tools and was prompted to have a look at muxtape by some blogs I follow at Wired , New Music Strategies and Sentric Music . It’s a mixtape for the digital age – you create an account and upload your favorite songs (either your own copyright or commercially released I think) and share the link with your mates. So I had a look through the archive of my string arrangement work, looking for examples I was pleased with but which aren’t available on YouTube or Last FM or iTunes, and I’ve uploaded them. If I haven’t had nasty letters from the copyright holders, there is a link (an rss feed) to my muxtape down the right side of this blog. There is little guidance on the site about legal requirements and I can’t help thinking after all these years of NOT uploading mp3s that are the copyright of others, that I shouldn’t be doing this! The carrot for copyright holders seems to be that each track you upload generates a search facility on Amazon, with a ‘buy’ link. Unfortunately, none of my tracks found the right buy link on Amazon. But it is a genuine celebration of music I like, that reminds of people, times, places and influences. This is my current muxtape (all dates are approximate!). 1 Small Town Sleeper – It Could Be You. I worked on 2 tracks for this band; it was my first job with Ken Lewis through Jen at Stronghold Entertainment in 2006. As soon as I heard the songs they clearly had loads of potential for strings and the album project was going to get a lot of commitment from the label . It Could Be You was the more quirky of the 2 and I tried to be equally left field with the strings. 2 Richard Mitchell – Cocktails from A Good Woman. Richard and I go back years! He is a distinctive and dedicated composer, and this track was from a movie score (2005). Richard’s musical style is eclectic and this project took us to 1930s jazz – a chance to play around with a genre I’d love to do more of. The builders were in at home, whilst recording was going on, so much of this was tracked in a small studio at the Cutting Rooms, Manchester. 3 Sean Boothe – Teeth And Claws. I’ve lost touch with Sean. He is a talented composer who amazingly has yet to gain recognition. His mastery over melody, harmony, texture and dynamics is second to none. The track was recorded on the tightest budget in Sean’s home studio; all the arrangements were prepared, I simply played the parts. I’m completely drawn into the song, which takes me on a journey of rise and fall that I find totally satisfying. Where are you Sean! 4 Snake Davis – The Hustle. Even before this job came along The Hustle was one of those tunes that appealed to me – I remember working it out on the keyboard and finding a naff flute sample to try playing it when I was much younger. Snake Davis gets himself on everyone’s recordings but this track is taken from his own album Hysteria, produced by Paul Birchall. 5 The Christians – Perfect Moment. It was about 1994 – I was musical director for a pantomime at the Liverpool Empire (starring Peter Howitt I think) and I was trying to build up my career as a string arranger. By some quirk of connections (as ever) I wrote some arrangements for The Christians. The Perfect Moment was the theme song to the movie Blame It On The Bell Boy. The sessions were at Angel and I recall squeezing them in on the pantomime’s day off (Monday). 6 Candi Staton – Young Hearts Run Free. For the album Outside In, back in 1998, I did arrangements for a few original songs (another Paul Birchall production, this time with K-Klass) but a re-make of this track was also included. It doesn’t get more fun than that! I was musical director for the UK tour of The Rocky Horror Show at the time and remember dashing back and forth between Sunderland and North Wales to fit this in. 7 Amy Wadge – Shattered. Another production with Henry Priestman. Simple but effective. The sort of track where the string arrangement just kind of writes itself. 8 Credo – The Resurrection. This was a Roberto Danova project, bringing together recordings of choirs around the world with some orchestration and production. Choirs recorded in Rome, Canterbury, Jerusalem and Moscow, strings recorded in Manchester! 9 Pete Whitfield – Orchestral Intro. This still gets me work! It was produced for a showreel with Jen at Stronghold EG. 10 Pete Whitfield – Pad 1. Back in 2000 I needed some examples on my website so I wrote and recorded some simple pads to give away. They still sound OK I think and I know they’ve been used by writers and producers around the world.